First Meeting in August – in Oxford! The Southfarthing trip to Oxford. This was the Southfarthing’s group outing to visit the Tolkien: Maker of Middle-earth exhibition at the Bodleian Library in Oxford. Sadly, even before we started we learned that Carol and Rosemary would be unable to join the party because Rosemary had developed flu-like symptoms overnight. This was such a shame as we haven’t seen them for a very long time. They would have travelled to Oxford by car, and we were still expecting Eileen to travel there by car while most of us travelled from Southampton together by train – no strikes, and seats all the way! Julie joined the train at Reading and we all met up on the platform at a sunny and warm Oxford. It’s a manageable walk from the station to the Bodleian, but the narrow pavements were packed with tourists of all kinds and it was a matter of keeping our eyes peeled so we didn’t continually but inadvertently photo-bomb their mementos. The walk also gave us time to go on chatting. Broad Street was similarly packed but it’s always exciting to look right into Turl Street and see Exeter College, although the Radcliffe Camera really dominates the view, and Julie reminded us of its influence on Tolkien as his idea of Sauron’s temple to Morgoth on Numenor. We assembled on the steps of the new Bodleian building across the road from the Camera to wait for Eileen to arrive. But as our entry time of 11.30 arrived without her, we made contingency plans and went into the exhibition. It was the script and the image of the Ring on the left hand wall of the vestibule that grabbed my attention until Angela’s attention to the floor alerted me to something even more dramatic – the floor was illuminated by sections of the Map of Middle-earth which moved, so it seemed as though it was possible to walk on it. As if this was not dramatic enough, raising ones’ eyes, revealed the Doors of Durin on the end wall – only a projection of course but entirely taking up the wall and brilliantly showing the mithril lines. It was such a shame that photography was not permitted – it was a perfect photo-opportunity. Everyone of us, including Eileen who eventually managed to join us after being held up in heavy traffic, seemed to find something of special interest in the exhibition itself. It was well laid out, although some of the manuscripts were a little high up for convenient reading. Some of their content was reproduced on lower panels and some of them would have needed to be flat on a table to be read with a magnifying glass, so faded was the writing after all these years. But seeing one of C.S. Lewis’s letters from 1949, reading Terry Pratchett’s enthusiasm for Farmer Giles of Ham [please see Julie’s comment below on this letter] and Iris Murdoch’s enthusiasm for The Lord of the Rings were significant moments for me. Julie later wondered what it was about Smith of Wootton Major that resonated with a young ‘Terence’ Pratchett, as he signed himself. 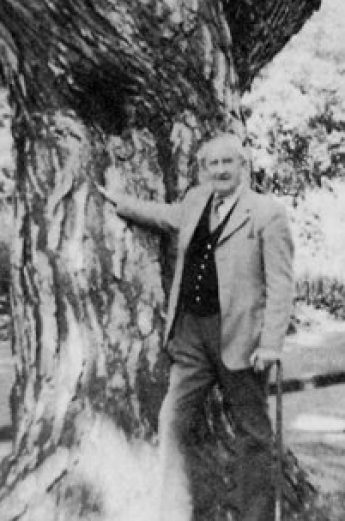 Eileen found the material on the genesis of The Silmarillion enlightening, and Ian found connections between the books on Tolkien’s desk and the early Tolkien family holidays in Wales. It was astonishing to see the desk at which Tolkien used to write in all its shabby ordinariness and to realize that upon that homely piece of brown furniture the scope and scale, diversity, and imagination of Middle-earth and its off-shoots developed and were laboured over. It gave me a more profound sense of the man who was the author than anything else, although the mock exam paper he once created for an Inklings meeting added a fleeting subversive scurrility that has hitherto been missing. Adding a further, and highly artistic dimension were all the newspaper fragments upon which Tolkien had created multi-coloured doodles as exquisitely detailed patterns. These, all drawn over the columns of type, really revealed Tolkien’s love of colour and shape as distinct from his better-known designs that illustrate elements of his stories. We were all surprised and impressed by these doodles in different ways. Laura identified one as looking distinctly Anglo-Saxon in its intricacy and colours, but Tim thought it looked more Celtic. I liked the ‘paisley’ designs, and the fact that the crosswords which seemed to have led to the creation of the ‘doodles’ were filled-in in alternating coloured pencils. Chris pointed out that all the crosswords (cryptic of course) were completed. Ian noted that one paper mentioned Bournemouth, another, the New Forest. Julie and I stopped for a while to look at the illuminated 3-D map table which showed the routes taken by various members of the Fellowship after Parth Galen. It was unexpectedly instructive to see the routes traced out by moving lights and to see in 3-D the relative distances. Laura found it touching to see Boromir’s last journey down Anduin. If we hadn’t had a table booked for a late lunch it’s possible we might have lingered over the exhibits until closing time. Pondering over the burn hole in one of the maps, from a lit pipe; considering the selection of pipes; the small sketch book of water colours, the box of water colours, and the conte pencils, and the lineage of the characteristic script, first seem in Mabel’s letter home to English relatives thanking them for the ‘aprons’ for the boys. Tolkien’s acknowledgement of his mother’s influence on his calligraphy also got a mention, but seeing her tiny delicate calligraphic handwriting made that influence quite unmistakable. Finally we tore ourselves away. Some of us briefly headed for the gift shop, without being greatly impressed by the range, or some of the prices. A Windsor chair of the kind Tolkien used at his desk was to be had for £800. No decent sized tote bags, which are always useful, or pens, but pretty cuff-links (who wears them these days?). Minor discontents, though, and hardly to be compared to the wonderful time spent immersed in Tolkien’s larger world. So we headed off through the hordes to Brown’s for a much-needed lunch. I highly recommend their mango, pineapple and passion-fruit smoothie – very refreshing. The fish and chips chosen by most of our group came with fish the size of half a whale, and the service was friendly and attentive. Gave us plenty of time to relax and discuss what we had seen, and there was so much that we were still there when they started serving afternoon teas! Tearing ourselves away once more as Eileen’s daughters arrived to collect her, the rest of us headed back to the station as the drizzle began to fall. Next time we meet I think we are still going to have plenty to talk about! Re. the letter from “Terence” Pratchett of 1967 – I recall he wrote that he had been expecting another light-hearted story like “Farmer Giles of Ham” but “Smith of Wootton Major” had turned out to be something more serious – it really seemed to resonate with something within him. I had a high opinion of Pratchett anyway but seeing that letter confirmed it. JS. Thanks to Julie for refining what I recalled of Terry Pratchett’s letter, and the spelling of his name! Sorry about that!